Have you seen the newest Peachy Keen Stamps release? Oh my goodness...talk about some adorable stamps! I just placed my order and can't wait to get my hands on them! I just ~love~ gingerbread men! My kitchen gets decorated in gingerbread people every Christmas! Don't ya just love that sweet little face? Well, I'm off to see if I can get something completed for Challenge #2. Thanks so much for stopping by and I'll be seeing you soon! Oh so adorable! You do "peachy" so well! Can't wait to see what's next! Hope you have a super evening! OMG! Love that cute lil' face! Very cute tag! I gotta get over there and see what they have. Tanya, this tag is adorable! 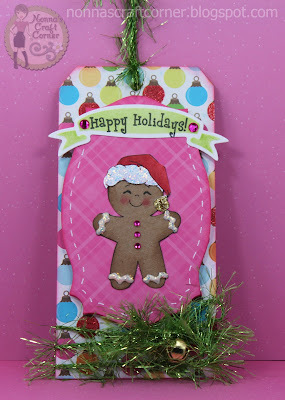 The gingerbread man is such a great set and just adore that face! Cute background paper to...love this! Your tag could not be any CUTER!!! :) I am lovin' it! And I like the Spellbinders you've been using lately, too. Great tag. Love your gingerbread man. So cute on the pink background. I love this! Absolutely adorable! The background paper was a perfect choice! Tanya ~ Seriously ADORABLE!! 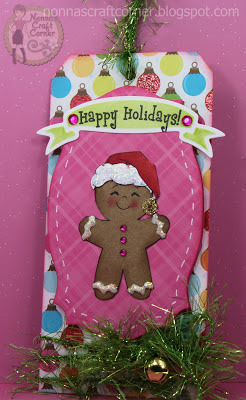 I LOVe the little gingerbread man on the tag!! His little icing is such a great touch!! Okay the tree trimming on the bottom ~ CLEVER idea! LOVE it!! Hope all is well with you!